This article provides additional guidance related to measurement and payment, as defined in Sec 109, and sets forth uniform and effective procedures for the maintenance of records necessary to document project payments. Documentation procedures shown are considered to be the minimum required to authorize payment for an item. It is not intended to discourage other or more detailed documentation should either or these be appropriate to the situation. It is intended that detailed records be prepared for all items and especially for those not accessible when a project is complete or for any pay item that does not remain a part of a completed project. The specifications provide the basis of payment and a description of most items. Field measurement, final plans and remarks instructions are included in this article for that specification or may be obtained from the Constructions and Materials division. Measurements performed, and the associated calculations, should be well documented in the project records and should be recorded to no less than the minimum specified precision of the measurement. (For example: “Measurement will be made to the nearest linear foot” means to measure to no less than the nearest linear foot.) Confirm that the tools being used to make the measurement are accurate within the range required for the measurement. Calculations may be made manually, with a calculator or a computer but in each instance the results should be independently verified to eliminate math, keystroke or computer related errors. Specifications typically have a "Method of Measurement" clause that indicates the minimum unit of measurement and pay. Each day that a work item is reported, the total quantity of work completed or material placed that day is to be totaled and then reported to a degree of accuracy no less than what is designated in the specification. Rounding is generally not necessary. For instance, tickets for hot mix asphalt generally show the measured quantity to the nearest hundredth of a ton even though the degree of accuracy per spec is only required to be to the nearest tenth of a ton. The tickets should be totaled to the nearest hundredth and reported to that accuracy in SM each day. The daily quantity does not need to be rounded nor does the final pay quantity at project closeout need to be rounded. When payment is made per station, it should be assumed that the work is performed in a single pass through the project limits and that the work may be along the centerline, on either side or on both sides. For example, work on both sides of the centerline that is one station long is to be paid as one station of work, not two. This guidance is to be waived when the specifications or plans are explicitly contradictory. Payment to the contractor and the exceptional situations that may affect payment are covered by Sec 109. Typically this applies to Major Items, which are marked in the Items window of SM. When there are no major items identified on the job, the greatest cost items on the job, that aggregately add up to 60% of the contract, are defined as the major items even though any one of them does not meet the 10% criteria of a Major Item. Differing site conditions include subsurface or latent physical conditions at the site differing materially from those indicated in the contract, or unknown physical conditions of an unusual nature differing materially from those ordinarily encountered and generally recognized as inherent in the work. Changes in, or extra, work includes items of work not provided for in the contract as awarded, but found essential to the satisfactory completion of the contract. When it is impossible to reach agreement on a fair price for necessary extra work having no unit bid prices, the work must be done on a force account basis. This means that the contractor will be reimbursed for the actual cost of labor, insurance and tax, equipment and materials. In addition, the prime contractor will receive specified percentages of these costs to cover supervision, overhead and profit. Contract provisions for this method of settlement are set out in Sec 109.5. Per the specification, the prime contractor will receive an amount equal to five percent of the actual cost of subcontracted work. Actual cost is defined as including the subcontractor’s work, overhead and profit. Before work is done on a force account basis, a change order must be approved to provide funds and authority for the work. The change order must be supported by the best available estimate of cost. The estimate should be carefully prepared to prevent large variations of actual cost from the estimate. Refer to the second paragraph of EPG 109.12.2 Estimate of Cost of Work Involved for instruction in preparing the change order. Daily records must be kept during progress of the work. This avoids later misunderstanding about the cost. Keep these records on either the one day version or the multiple days version of the Force Account Worksheet. An example of the force account worksheet is available. In the upper right corner, place the number of the change order that originally authorized the force account work. This will serve to identity all associated reports. If the work is temporary erosion control authorized by order record, use the order record number and initials, O.R. Number the report consecutively for each day's work until the operation is completed. Write “Final” after the report number on the last daily report. Route, county, and project should be placed in the appropriate spaces. Give a fairly detailed description in the space provided for Description of Work. Include the location of the work to be done. Place this data on Report No. 1. It need not be repeated on subsequent daily reports. (a) The people employed on the work must be listed daily. This makes it necessary for the contractor to furnish the required information for each employee expected to be used on the work. Separate lines are provided for regular and overtime hours. The hours shown for each employee should be the actual hours worked each day. Separate columns are provided for the rate per hour and the fringe benefit rates per hour. The rates shown should be verified by a copy of the contractor's payroll, if available, or from the contractor's statement required by Sec 109.5.7. (b) Lead workers, as described under Sec. 109.5.1, must be paid no less than the prevailing hourly wage for the classification they are working in. If a lead worker is salaried, the contractor must provide documentation of the amount actually paid and the hours actually worked. This documentation is required by Sec 109.5.7. Salaried superintendents are not covered by the prevailing wage provisions and should not be included in the labor account. Their expenses are covered by the 20 percent overhead and profit as provided in Sec 109.5.2. If actual wage rates and fringe benefits cannot be determined in advance, it will be satisfactory to use rates shown in the contract for each classification. If rates from the contract are used, it will be necessary to obtain the actual rates paid by the contractor and make revised sheets before preparing either the one day version or the multiple days version of the Summary of Costs for the force account work. The contractor’s representatives should sign any revised sheets. Total the labor account at the end of each day. Add the previous day's total to get a running total to date. Check the appropriate spaces at the bottom of the page to indicate whether there were any materials or equipment charges that day. If the answer in both cases is no, the "Equipment and Materials Account" will not be required for that date. On the lower left of the form is space for the signature of the resident engineer, or of the employee designated in writing to sign the daily forms. ALternately, this can be done by attaching a digital signature to the form once it has been changed to a pdf document. The employee designated in writing by the contractor shall sign immediately below MoDOT's representative. Insert the name of the contractor below the space for this signature. Give the contractor the original and retain two copies. The MoDOT copy may be retained electronically. Complete this portion of either the one day version or the multiple days version of the Worksheet, if either materials or equipment charges were assessed for the day. Place the same information in the upper right corner as was placed on the Labor Account portion of the Worksheet. The report number is to be consecutive for the Equipment and Materials Form. It need not agree with the number on the Labor Account Form. The headings for the various spaces under Materials Account are self-explanatory. Each equipment unit must be listed separately. The contractor must supply information on all equipment to be used on a force account basis. The information must be in sufficient detail to allow accurate determination of the allowable rental rent according to Sec 109.5.4. Rental rates on file with the Commission are the rates contained in Rental Rate Blue Book for construction equipment. Equipment Rental Rates from the Blue Book For contractor-owned equipment, apply the Model Year and Region adjustments, then divide the monthly rate by 176 hours to obtain the FHWA approved hourly rate. The listed estimated operating cost per hour is also applied for the time the machine is in use. In all other cases, the resident engineer should negotiate rental rates with the contractor, subject to approval by the district. Sec. 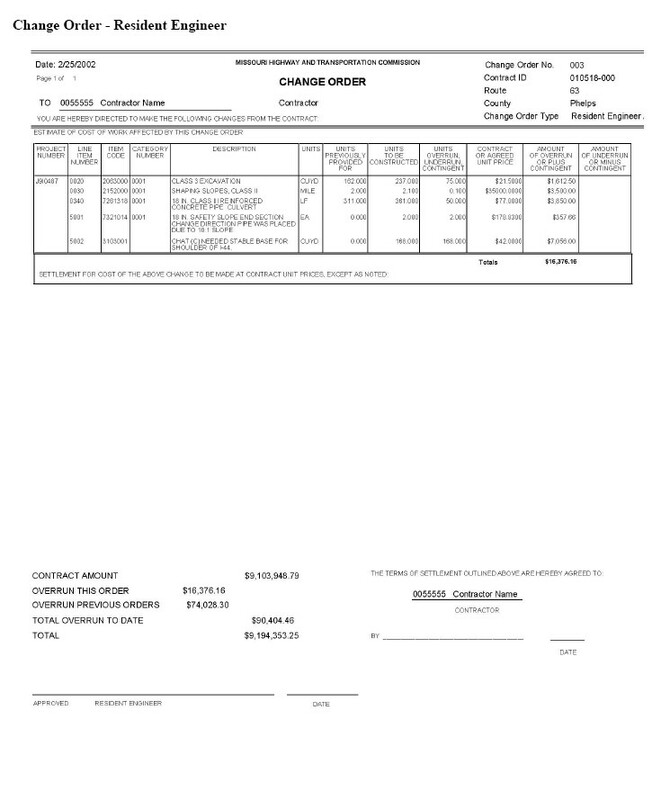 109.5.4 states, "In no case shall the rental rates exceed those of established distributors or equipment rental agencies.” Proposed rates for contractor owned equipment may not exceed the rate determined by the above paragraph or the rate charged locally by equipment rental companies, whichever is lower. If special cases indicate that higher rates may be justified, send the proposed rates to Construction & Materials with the district's recommendation and data to support the proposed rates for division review. Contractor's proposed rates shall be submitted to the resident engineer in writing. The proposal shall state whether the rate includes fuel and lubricants. After district concurrence, the resident engineer shall grant approval in writing. The written proposal and approval make up the agreement. Send both letters to the district with either the one day version or multiple days version of the Daily Force Account Record, Summary of Costs after the work is done. When this has been done, use of the various column headings is based on the agreement. The columns for No. Hours, Previous Hours, and Net Hours are self-explanatory. They are to be used regardless of rental basis. If equipment is to be used on an hourly rental basis, the Hour Rate multiplied by the Rate Adjustment Factor will be used. In all other cases, list the rental on either a weekly or monthly basis as agreed. When equipment is rented from a recognized rental agency specifically for the force account work, the contractor will normally be allowed the actual rental paid. This must be established by paid invoices. If contractor-owned equipment must be kept available full time at the site, or if it is specialized equipment for which there is no other use on the project, it may become necessary to allow rental on a full time basis. The unit should then be shown at 8 hours of rental for each day, Monday through Friday, at the hourly rate established as outlined in the Rental rates on file with the Commission paragraph, above, unless the resident engineer has authorized overtime use of the equipment. If the agreed rate is "bare" rate, the agreed operating cost per hour would be added to the "bare" rate only for actual operating hours. If contractor-owned equipment is to be used on a part-time basis and will be used for other work on the project, it should be carried on the equipment account at actual hours used. If equipment must be shipped to the project specifically for force account work, the shipping costs are reimbursable. Such costs should be carried in the equipment account by listing the unit involved and showing the shipping cost under amount. Write in the invoice number, noting it as shipping cost, under the rate headings. For the time required to move the equipment to and from the site of the ex work and any authorized standby time, the rate will be 50% of the hourly rate after the actual operating costs have been deducted. The Summary of Costs, (either the one day version or the multiple days version), is prepared in quadruplicate when the force account work has been completed. On the Summary, place in the upper right corner the number of the original authorizing change order. Complete the description and location of work in considerable detail. Give the original to the contractor. Retain the fourth copy in the resident engineer's file. Send the other two copies to the district office for checking. One copy sent to the district office is to be accompanied by a copy of each daily report for checking. 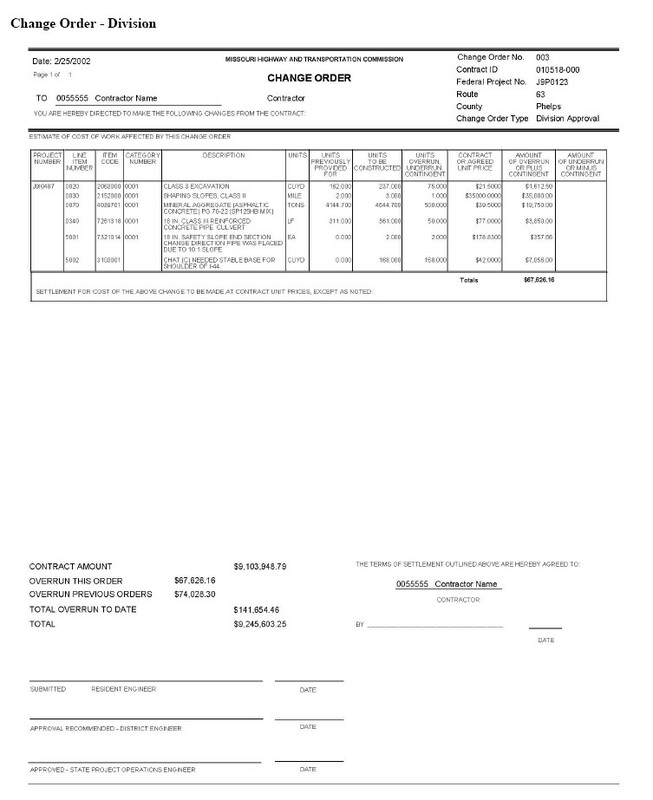 The daily reports, after checking, are to be filed with the district copy of the Force Account Record Summary of Costs. Contractor payments are made electronically to the contractor’s designated financial institution on the basis of the payment estimate which is created twice a month when work on a contract is active. Payment estimates must be supported by documentary evidence that work items allowed have actually been done. Evidence may be in the form of scale tickets, diary entries, material receipts, etc. The payment estimate is intended to provide payment to the contractor for all work performed during the estimate period. In no case should payment for work be delayed beyond the estimate period following the period in which the work was performed. Earthwork quantities may, for example, be supported by load count entries in the inspector's diary. Another way is by diary entries giving limiting stations of completed balances. Weight or volume tickets are a sound basis for allowing payment on items measured in this manner. Check all items against inspection records to be sure they are properly approved. Provide equitable payment. If work remains to be done (for example, patching the tie holes in concrete) allowance for the appropriate pay item should be reduced. The reduction should be the amount estimated as the cost of completing the work. Make allowance in full for all completed items. Items to be paid for by Planning in connection with weight station complexes are to be included on the regular Engineer's Payment Estimate. At conclusion of this work, a certification is to be submitted with the estimate stating that the scales and material used met specification requirements. Bid items not covered in the bid item master list will be indicated in the description block by the term "Miscellaneous" and supplemental number. The resident engineer may insert an abbreviated description using SM. Engineer's Payment Estimates should be submitted for liquidated damages even when no pay items are listed. Such estimates indicate a negative amount due the contractor; accordingly, no payment can be made and no further action is taken. Partial payments are payments made over the course of the contract each estimate period, and payments made for material allowance. Payment estimates are generated by the SM computer software application. 109.7.1.1. Estimates will be generated for all active contracts, regardless of the amount of payment encountered during the estimate period. This includes all estimates for contracts which will produce payment, "no pay" estimates (zero dollar value) and estimates which result in a negative payment. Should the contract be inactive and a series of estimates will be no pay estimates, a letter or e-mail shall be sent to the contractor with a copy to the controller's office stating estimates will not be generated during the following time periods because there is no work conducted on the contract. The controller's office will record this information and will not contact the Resident Engineer because estimates haven't been generated for a specific time period. 109.7.1.2. The first level of estimate generation will be designated by the Resident Engineer at the time of contract activation. The Resident Engineer will notify the SM Administrator who this person shall be. This person must have project manager access to the system. Progress estimates will be generated for estimate end dates of, generally, the 1st and 15th of each month. The controller's office will issue a chart of estimate due dates annually. SM estimates must be approved by Level 2 (Resident Engineer) no later than 4:00 PM on the day listed on the chart as "Due in Controller's Office." 109.7.1.3. Estimates may be generated repeatedly prior to the estimate ending date, in order to resolve discrepancies or check quantities. Two payment estimates shall be made per month for active contracts. The official pay estimates shall be generated with the period ending dates of the 1st and the 15th, making the estimate periods typically the 2nd day of the month to the 15th day, and the 16th day to the 1st of the following month. There may be exceptions to the estimate periods depending upon the financial systems such as the end of the state fiscal year. Other exceptions may be made to the estimate period depending on the status of the contract or as notified otherwise by the SM Administrator and in the first paragraph of EPG 109.7.1.4, below. All indexes based upon a monthly index value shall use the same index value for the entire estimate period even though the index value may be reestablished on the 1st of the month. For example the asphalt and fuel index values change on the 1st of the month, but any work completed on the 1st shall use the same index value as the previous month so that the entire 16th to 1st estimate period uses the same index value. Estimates can be re-generated without deleting the existing estimate from the Estimate History window. Do not use the "delete" option to delete an estimate. To re-generate an estimate for a pay period, just generate that estimate. The system will indicate that an estimate already exists for the period, and will prompt “Would you like to delete?” (meaning to overwrite the existing estimate.) Select "Yes", which will reset the tables and the estimate will be generated containing any new information that has been added. 109.7.1.4. The progress estimate for the period ending July 1 of each year shall be changed by the user to the period ending date of June 30th, prior to estimate generation. This change shall be made to coincide with the MoDOT Fiscal Year End cycle. Supplemental estimates will not be generated unless specifically instructed to do so by the SM administrator. Final Estimates shall be generated by the Resident Engineer prior to submission of the final plans to the District for checking. When logged into the system as a Resident Engineer, only final estimates can be generated. For a Resident Engineer to generate a progress estimate, they must log in as a project manager. 109.7.1.5. Payment estimates must be supported by documentary evidence that work items allowed have actually been done. Evidence may be in the form of scale tickets, diary entries, material receipts, etc. Earthwork quantities may, for example, be supported by load count entries in the inspector's remarks. Another way is by remarks entries giving limiting stations of completed balances. Weight or volume tickets are a sound basis for allowing payment on items measured in this manner. The payment estimate is intended to provide payment to the contractor for all work performed during the estimate period. In no case should payment for specification compliant and accepted work be delayed beyond the estimate period following the period in which the work was performed. 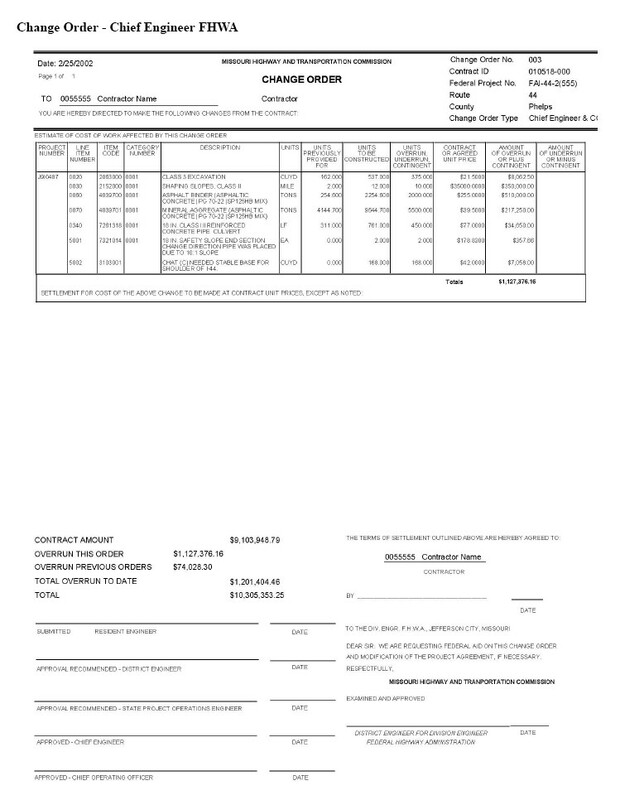 General: The Cognos report “Estimate Summary for Contract, By Estimate Number” is the official estimate report to send to the prime contractor on all MoDOT contracts administered through SM. This will establish the policy and procedure related to this function of SM. Prior to producing this report, it shall be the responsibility of the Resident Engineer to verify the accuracy of the estimate and to approve the estimate in SM. The Resident Engineer will make this verification by confirming the Last Approver ID is the User ID of the Resident Engineer in the Estimate Summary of each contract. After the RE has verified the estimate has been approved at the Resident Engineer level, the Estimate Summary for Contract, By Estimate Number shall be printed and saved as a .pdf file on the V drive in the Contract Information Archive folder. Refer to EPG 137 Construction Inspection Guidance for Records to be Maintained for more information on saving reports produced from SM or information retrieved from SM. Under stockpile materials should appear those items for which a payment may be made in accordance with the general requirements. Check the specification for the minimum acceptable material allowance. Non-perishable items to be incorporated in the finished product may, in general, be included on the estimate for stockpile materials provided satisfactory inspection reports, certifications or mill test reports and required invoices are in the project file. 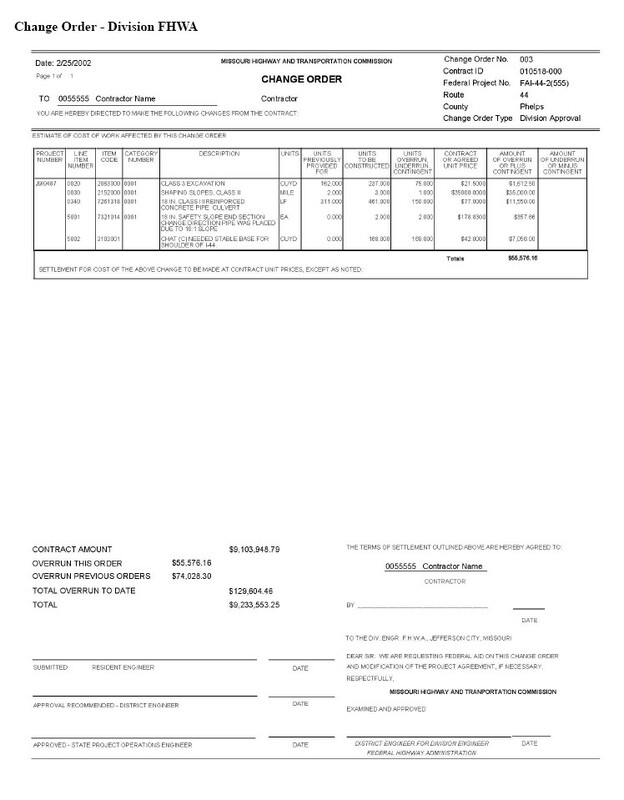 When the item first appears on the estimate, the resident engineer must have on file a copy of an invoice to substantiate the unit prices allowed. Receipted bills for all materials allowed on the estimate must be furnished to the resident engineer within the time established by specifications, or the item must be eliminated from future estimates. Missouri state sales tax may be included in material allowances if shown on invoices or receipted bills. Each receipted bill must be marked or stamped paid with date of payment shown, as well as the name of the firm and signature of the person who received payment. All invoices and receipted bills obtained to substantiate material allowances during progress of the project are to be filed in the district as part of the permanent project record. On the date that payment is made for stockpiled material, the Resident Engineer’s diary should include reference to that payment, the location(s) of the stockpiled material, whether a lease agreement was necessary and the file location of any required lease agreement(s). Some aggregates are accepted for "quality only" at the point of production. Total acceptance is not made at the time of production because additional processing and/or screening are required before incorporation into the final product. If gradation tests, which are run for information purposes only, indicated it is reasonably possible to produce an acceptable finished product, this material may be included in the stockpile material payment. If test reports or visual inspection on the above material or other material that might be produced and accepted indicate that it will be unsatisfactory at a later date due to gradation, excess P.I., segregation, contamination, etc., these materials should not be included on the stockpile materials payment. The price per unit for material produced by the contractor or by a producer other than an established commercial producer should reflect the actual cost of production. The units shown under material estimate should be the same unit of measure used in the bid item where possible, such as pound for steel, linear foot for piles, etc. Where this is not possible, a convenient unit such as ton for aggregate should be used. Quantities in excess of contract requirements should not be allowed. Hauling costs should not normally be included in the unit cost of any material unless it has been hauled to a site where it can immediately be incorporated in the finished product or work. If hauling cost is allowed, it must be considered with relation to the value of the material in case it is necessary for the state to take it over. Stockpiling costs are not to be included as part of the unit cost. Items that are to be accepted by project personnel must be inspected and found satisfactory prior to being included on a stockpile materials payment. Quantities for materials included on a stockpile materials payment should never exceed approved quantities. Before an allowance will be approved for payment on material stockpiled or stored on private property, or for aggregates stored on property operated as a commercial business, a lease agreement from the contractor or subcontractor showing compliance with the following points must be submitted to the district office for approval. 1. A complete land description covered in the lease form and the haul distance from the lease area to the project. "It is understood and agreed by the parties hereto that the land herein involved is to be used as a materials storage site and that the prime contractor, whether or not the lessee herein, may obtain payment from the Missouri Highway and Transportation Commission for material stored thereon". "It is further understood and agreed by the parties hereto that the prime contractor or contractor having a written agreement with the Missouri Highway and Transportation Commission for the construction of highway work involving this lease and the materials stored thereon, whether or not the lessee, and the employees of the Missouri Highway and Transportation Commission shall have the right of access to the property covered by this lease at all times during its existence and that in the event of default on the part of the lessee or the prime contractor, if other than lessee, the Missouri Highway and Transportation Commission may enter upon the property and remove said materials to the extent to which advance payments were made thereon". An area leased on property operated as a commercial business must be posted so as to divorce the site for stockpiling of highway materials from the commercial operation. If either party to the lease agreement is incorporated, it is essential that an Acknowledgment by Corporation be attached for each corporation involved since an individual cannot legally bind a corporation without duly enacted authorization by the corporation's Board of Directors. A suitable form for this purpose is shown in Agreement for Shifting State Highway Entrance, page 1. Other forms may be used by some corporations and are acceptable if they fulfill the intent of the form illustrated. Leases involving corporations should not be accepted without the Acknowledgment. Signatures by individuals must be notarized, or be witnessed by at least two disinterested persons. The address of witnesses should be shown. When material is stored on property owned by a railroad and is accessible by a public roadway, it is not necessary to obtain a lease agreement to permit this material to be placed on the estimate as a stockpile material. If hauling charges are to be included as part of the cost of materials allowed for payment, invoices for hauling charges must be provided by the contractor in the same manner as invoices for the material. An exception to this requirement is allowance for the cost of the rail freight. For rail freight the contractor should supply a copy of the first freight bill to substantiate the freight rate. 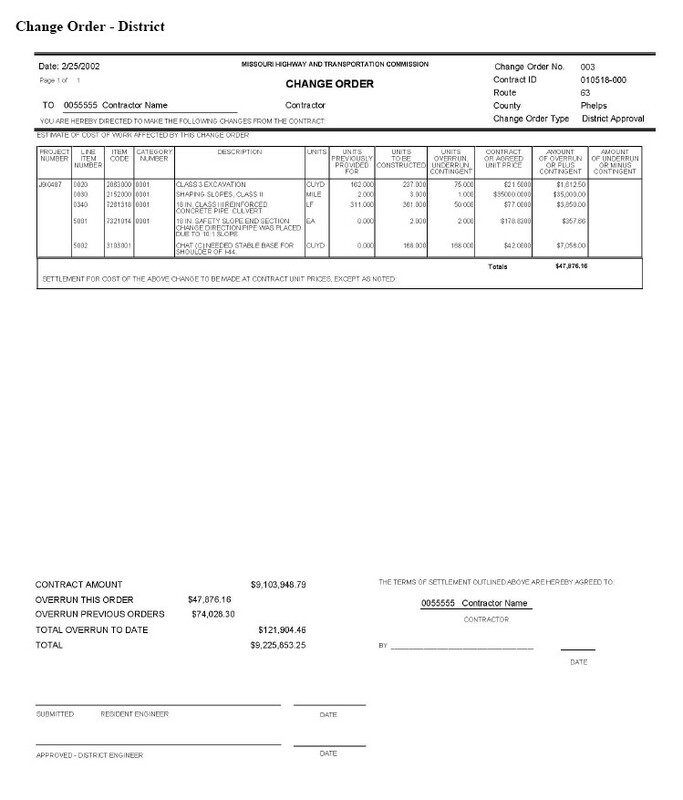 In lieu of submitting receipted freight bills, the contractor may then sign a statement on each material invoice indicating that freight charges have been paid. If the contractor prefers, a letter may be submitted listing several invoices and indicating freight charges that have been paid. Whichever procedure is adopted, the resident engineer must be assured that freight charges have been indicated as paid for all materials invoices submitted to verify quantities. The engineer may also include in any payment estimate an amount not to exceed 90 percent of the invoice value of any inspected and accepted fabricated structural steel items, structural precast concrete items, permanent highway signs, and structural aluminum sign trusses. These items must be finally incorporated in the completed work and be in conformity with the plans and specifications for the contract. These items may be stored elsewhere in an acceptable manner provided approved shop drawings have been furnished covering these items and also provided the value of these items is not less than $25,000 for each storage location for each project. 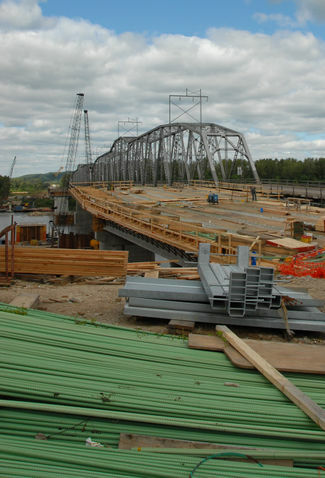 The engineer may also include in any payment estimate, on contracts containing 100 tons or more of structural steel, an amount not to exceed 100 percent of the receipted mill invoice value of structural carbon steel or structural low alloy steel, or both, which is to form a part of the completed work and which has been produced and delivered by the steel mill to the fabricator. While the nature and quality of material is the contractor’s responsibility until incorporated into the project, material presented for stockpile materials payment must be inspected prior to being approved for payment. The nature of that inspection is at the discretion of the engineer and may include sampling and testing to determine whether the material has a reasonable potential of compliance, once incorporated into the project. This sampling and testing may occur wherever the material is offered for stockpile materials payment, including stockpiles in quarries and at other off-project sites. Material that is a component of a mix may be compared to the associated mix design or to any other specification criteria that may apply. In addition to confirmation of final quantities, all other adjustments to the contract amount should be reviewed and verified prior to the final payment to the contractor. What should the RE do when contacted by a supplier or subcontractor claiming they have not been paid by the prime contractor? Intervening in pay disputes between the prime and the prime’s suppliers and subs should generally be avoided. MoDOT contracts only with the prime contractor. When contacted, provide them with the bonding company’s name and contact information. Also note the name and nature of the dispute for a reference when the C-242 is received at the completion of the job. Pay retainage should not be held from the prime contractor on these disputes. Two-party checks should not be issued unless specifically requested in writing by the prime contractor. Payments should not go to the bonding company unless a letter is received from the bonding company stating they have taken over the job and that they request all future contractor payments go to them. The C-242 form submitted by the prime should list all pay disputes and reason for no full payment, if any. The C-242 must be filled out entirely and accurately. If the prime has fulfilled all contractual obligations, the contract can be closed. The job should not be kept open due to pay disputes between the prime and the prime’s suppliers and subcontractors. When the job is scheduled to be closed, a courtesy notification may be made to anyone who has contacted the RE about non-payment. Note this contact is not mandatory but is a courtesy only. This contact would inform them of the project closing so they have an opportunity to file a claim with the bonding company if they have not already done so. If the pay dispute involves a Disadvantaged Business Enterprise (DBE), consult External Civil Rights on guidance on how to proceed. Formal retainage is no longer designated by MoDOT as a routine part of the contract however 34.057 RSMo does allow up to 10% of the contract price to be retained in order to ensure performance of the contract. Payment may be withheld on any particular work item that has not been completed in accordance with the contract. This can include work incidental to the work item, and required documentation directly related to the work. No transfer or assignment of contract rights or responsibilities is allowed. Review the specification and refer the issue to the Construction and Materials division before any decision is made regarding this specification. The specification designates the conditions for which compensation may be appropriate to cover the cost of a project delay. Review the specification and refer any questions to the Construction and Materials division. A change order is a supplement to the contract. It is prepared to provide authority to pay for revisions in quantities and to authorize changes in scope of work, design concept or specifications. Changes in scope should be limited to the original intent, purpose and limits (length and width) of the job. In instances where proposed changes in scope go beyond these original job parameters the change order shall be considered a major change order and Construction and Materials will discuss the proposed change with the Asst. Chief Engineer. Change orders must have approval before the work is done. Exceptions are granted for routine or minor changes, or emergency revisions for which verbal approval has been granted. In rare cases it may be necessary to proceed with emergency measures without prior approval. In such cases verbal approval should be sought as soon as practicable. Indicate in the diary or letter of transmittal the name of the individual who provided that verbal approval. Change orders providing for additional payment should be processed in sufficient time to allow payment on the next estimate following the period in which the work was performed. When a major change order is received in Construction and Materials, it must first be reviewed and approved by one of the Construction and Materials liaison engineers. Often the liaison may ask for more information on change orders than the resident engineer feels is necessary since the resident engineer is on the job and the answer appears quite simple and obvious. However, it is difficult for reviewers away from the construction site, such as the District Construction and Materials Engineer, to get a clear understanding unless a detailed explanation is provided on the change order. A clear description or drawing can expedite processing the change order. Job Order Contracts have unique terms that limit spending to a budgeted amount and may include pre-approved time extensions. Reference EPG 147.3.9 Change Order Approvals for guidance on how to administer change orders for Job Order Contracts. Change Order approval levels are automatically set by the construction management system. All change orders must be approved at Level 1 (Resident Engineer). If a given change order exceeds the criteria from this chart, it would also need to be approved at the additional Level(s) shown. The chart values are absolute values. The criteria that requires the highest level approval always prevails over other criteria. The approval level for a change order marked "Combination" is determined by the various independent components of the change order. 2. Any change in a contract or contingency item less than $50,000. Examples of a Resident Engineer Change Order Report are available. 1. Final change orders, if one is necessary. 2. Any change in a contract item or contingency item from $50,000 to $100,000. 3. Any new contingency item from $50,000 to $100,000. Examples of a District Change Order Report are available. 1. Any change in a contract or contingency item under $100,000. 2. Any new contingency item under $100,000. District Approval - For change orders that require Level 2 or higher approval, the RE will send an email to the District Construction Engineer that includes a direct link to the electronic change order stored in the CIA. If the change order includes any supporting documentation, a link to those documents should also be included in the email. For federal oversight projects, the District Final Plans and Reports Processor (DFP&RP) will forward the email on to the appropriate FHWA Transportation Engineer for approval. The DFP&RP will reply to the RE once all approvals are complete. For Level 3 or 4 change orders, the RE should copy the Construction Liaison Engineer on the email to the DCE so that the CLE can begin review as soon as possible to expedite approval. 1. Any change in a contract or contingency item greater than $100,000. 2. Any new contingency item greater than $100,000. 4. Any revision in a contract unit price. 5. Any change in a major line item greater than 25% from the original contract amount for that line item (in dollars). 6. Any change of the contract amount greater than 25% of the original contract bid amount (also in dollars). 7. Any change in design concept. 8. Any change order not approved by the contractor. 9. Any change order for adjustments due to differing site conditions or significant changes in the character of the work. 10. All value engineering change orders regardless of cost. 11. Any change order granting a time extension. Examples of both a Division Change Order Report and Division and FHWA Change Order Report are available. 1. Additions greater than 50% if the original contract amount was $500,000 or less. 2. Additions greater than 25% if the original contract amount was greater than $500,000. 3. Additions greater than $1,000,000. Examples of both a Chief Engineer Change Order Report and Chief Engineer and FHWA Change Order Report are available. Final change orders are used to convert quantities to final status at completion of the project. If no final change order is necessary due to all quantities being updated to final status by previous change order, a statement to that effect should be included in the final plans submittal letter. Change orders are to be numbered consecutively per contract. Care must be taken when choosing the report form to use for printed change orders to ensure the proper change order type is displayed. Reports sent outside the department should be saved. Supplemental information necessary to document the change order should be attached to the change order and are considered part of the change order and, whenever practical shall be indicated as such. The attachments should include contract number and change order number. The different levels of change orders are generated by SM based on the definitions of change orders provided in this article. If the contract is designated for federal involvement on change orders on the PODI Matrix, FHWA approval will be required for Level 2, 3 and 4 change orders. The contractor should be encouraged to use the digital signature process for approval of change orders. A QRG is available to demonstrate how to register a digital ID with MoDOT. Use of digital signatures eliminates unnecessary delays in processing change orders. Resident Engineer Approval - The Resident Engineer will send the change order in PDF format to the contractor as an attachment to an email. The contractor applies a MoDOT-registered digital signature and returns the electronic document to the RE by email. The RE then applies his/her digital signature and saves it to the Contract Information Archive. If the contractor mails an ink signed copy back to the RE instead of using a digital signature, the RE must scan it to the CIA, apply his/her digital signature, and retain the original contractor-signed paper copy in the project office file. Scanned copies with a signature from the contractor are not acceptable. We must have either a digitally signed document or an original paper document signed in ink. Original paper copies must be retained for a period of 11 years following final acceptance. District Approval - For change orders that require Level 2 or higher approval, the RE will send an email to the District Construction Engineer that includes a direct link to the electronic change order stored in the CIA. If the change order includes any supporting documentation, a link to those documents should also be included in the email. For projects designated for federal involvement on change orders on the PODI Matrix, the District Final Plans and Reports Processor (DFP&RP) will forward the email on to the appropriate FHWA Transportation Engineer for approval. The DFP&RP will reply to the RE once all approvals are complete. For Level 3 or 4 change orders, the RE should copy the Construction Liaison Engineer on the email to the DCE so that the CLE can begin review as soon as possible to expedite approval. Division, Chief Engineer /Chief Financial Officer and FHWA Approval – Following approval by the District Construction Engineer, the DCE will forward the email with links to the Construction Liaison Engineer for approval. The liaison will obtain digital signatures for Level 4 approval, when necessary. For projects designated for federal involvement on change orders on the PODI Matrix, the liaison will forward the email on to the appropriate FHWA Transportation Engineer for approval. The liaison will reply to the DCE and RE once all approvals are complete. Change orders are required for a variety of contract changes including Milestones, trainees and contingent items. Provide a statement, describing the change and the reasons for it. Be brief, yet accurate and complete, in descriptions and reasons. Check controlling specifications carefully to be sure they definitely establish MoDOT’s responsibility for payment. If the change order includes a contingent item for which the method of payment is not established by specification, a detail of all work covered by that item and the section of the specifications covering construction of that item must be shown. Attached sheets are used to list reasons for the change order. Use actual reasons such as grade changes, incorrect shrinkage factor, deletions, erosion, etc., rather than general statements that merely state that quantities vary. Use of the term "within normal tolerance" must be tempered with good judgment. If the change order is intended to cover final quantities for a bridge, the words "final quantities", the bridge stationing, and the bridge numbers should be placed at the head of this paragraph. This type of change order should be submitted as soon as practical after completion of the structure. This section of the change order is self-explanatory. List items in the same order as they appear in the contract. No combination of items will be permitted. List bridge items separately under the bridge station together with the number of the bridge involved. If a contingent item is identical to a Computer Stored Bid Item, it should be identified by the contract item number from the computer list. If a force account settlement is involved, the contingent item should be identified by contract item number 109.4000. If work is done on a force account basis, the unit price should be shown as 1.00 and the units to be constructed would be the estimated cost. Final costs will normally require an adjustment to be made in the units overrun or underrun. This procedure will allow final costs to be accurately handled by the computer. When contract unit prices govern all changes, no statement is necessary. Agreed unit prices, prices established by Standard Specifications, or force account settlements should be listed in this section along with the basis on which the price was established. If agreed prices are used that cannot be substantiated by the current unit bid price booklet, substantiating data shall be attached to show how the price was determined. 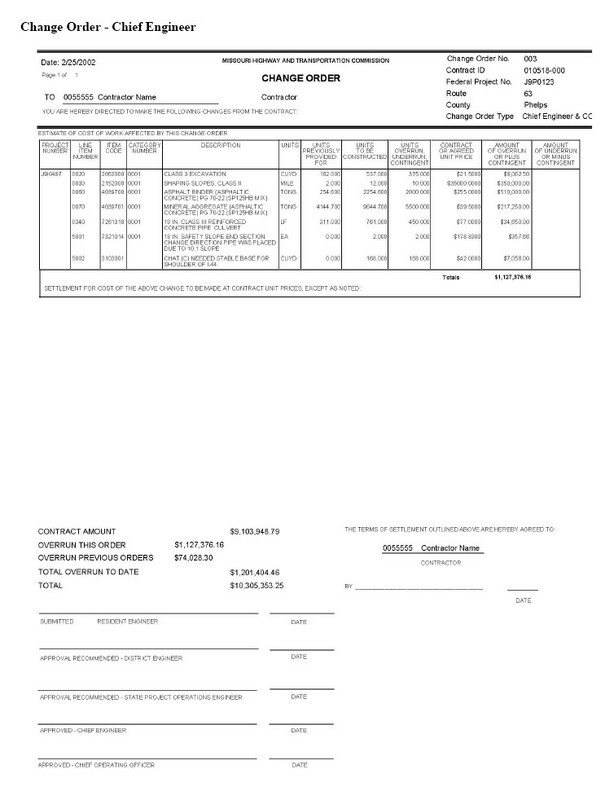 The Force Account Worksheet, (one day) or (multiple days), may be used to prepare this estimate. Attach the summary of force account costs to any change order that corrects a previously approved force account item to final status. All contingent items must include a specification containing the basic details used in the standard specifications. These are description, materials, construction requirements, method of measurement and basis of payment. References to the standard specifications may be used when applicable. A miscellaneous payment should be shown as an overrun in Section 2 of the change order. This overrun should then be shown in the box on the lower left of the change order in the same manner as any other contract overrun. The amount of a deduction should be shown as an underrun in Section 2 of the change order and carried over into the box on the lower left of the change order in the same manner as any other contract underrun. Items such as payment for leftover materials or deductions for liquidated damages do not require change order approval. If the change order includes a contingent item for which the method of payment is not established by specification, it must be signed by the contractor. The contractor's signature should not be requested until it has been definitely established that the contractor is entitled to payment for the contingent item involved. The contractor's signature should be requested on all final change orders. The contractor should be requested to sign all other change orders. The contractor's refusal to sign the change order should be documented and this documentation included with the change order if it must be submitted for approval. Change orders must be submitted as soon as practicable if they involve contingent items or changes in design features so that approval or rejection will be made before plans to perform the work materialize. Change orders covering overruns or underruns should be submitted promptly since they affect the contractor's monthly payment estimate. "The amount being paid to <Construction Company> in this Change Order represents a negotiated settlement and, as such, reflects payment of all claims of <Construction Company> and/or any of its subcontractors and suppliers direct and indirect, including all impacts there from starting from the date of execution of the contract until the execution by both parties of the Change Order. However, nothing in this Change Order affects <Construction Company>'s right to file a claim based on an occurrence after the date of this Change Order." Note: Do not include the last sentence if the change order is final. All change orders granting a time adjustment, whether for overall contract time or for milestones, must be approved by the division office with FHWA approval, if necessary. The following parameters clearly define when change orders for contract time adjustments are required or when they are not. If the Substantial Completion Date is after the Original Completion Date and/or the Adjusted Completion Date for the contract and NO liquidated damages are being charged, a contract time adjustment is required. The project office will create a time adjustment change order to account for the work completed after the Original Completion Date and/or Adjusted Completion Date. Otherwise, liquidated damages must be charged. If the Substantial Completion Date is on or before the Original Completion Date and/or the Adjusted Completion Date for the contract AND exceptions to the contract remain that require physical work, NO contract time adjustment is necessary. However, remarks must be entered in the Daily Work Report or Diary on any day work being performed is for the exception(s). In addition, references to these remarks must be made in the Final Inspection Key Date remarks area. If the Substantial Completion Date is on or before the Original Completion Date and/or the Adjusted Completion Date AND exceptions remain BUT no physical work for the exception(s) is required (seed growth, warranty items etc. ), NO contract time adjustment is required. However, the exception item(s) must be recorded in the Final Inspection Key Date remarks area. Prompt payment of subcontractors is defined by Sec 109.13. The prime contractor shall coordinate with subcontractors to assure all subcontractors are paid within 15 days. The Resident Engineer should provide the following to facilitate the process: The RE will provide an approved payment estimate to the prime contractor within 3 business days of the end of each estimate period. This approved payment estimate will provide a summary of all quantities paid to the contractor in order to facilitate the payment to the subcontractors. Issues related to this subject can be forwarded to Construction and Materials. A related subject, Prompt Payment of Contractors, is related to 34.057 RSMo Missouri Revised Statute 34.057. Prior to bid, the contractor must determine whether they will bid their project based on projected fuel prices, or if they will choose to utilize the fuel price adjustments provided in Sec 109.14. In their bid proposal, they will choose to accept or decline receiving a fuel adjustment for the bid items identified in Sec 109.14 when the contract is executed. Bidders must choose to accept or decline the fuel adjustments for qualifying pay items in each of the four categories: excavation (production), asphalt paving (production & hauling), concrete paving (production & hauling), aggregate base (hauling). Production factors account for fuel used in producing and placing a product (e.g. asphalt plant burner fuel, paver fuel, distributor fuel, etc. ), whereas On-Road Hauling factors account for fuel used to haul the material to the project. The On-Road Hauling factor is based on a 30-mile round trip. This is an average factor that is always used regardless of the actual haul distance. SM automatically calculates the fuel price adjustment for most applicable pay items. In general, miscellaneous work items designated with a “99” item number must be calculated manually, although there are a few that are auto-generated. Each estimate should be checked to verify that the appropriate fuel adjustments are being made either manually or auto-generated. A spreadsheet is available on MoDOT's V drive (V:\Forms and Spreadsheets\Fuel Adjustment Calculation.xls) to assist with any required manual calculations. Prior to calculating the adjustment, a check must be done to verify that the unit pay item matches the unit shown in the table in Sec 109.14. If not, a quantity conversion must be done before calculating the adjustment. For example, asphalt paid by the square yard would need to be converted to tons before multiplying by the corresponding factors in the table. The manually calculated fuel adjustment should then be added to the estimate as a line item adjustment for the designated lines. The spreadsheet calculations should be retained with the contract documentation. Payment for work should be made in the pay period in which the work was performed in order for SM to calculate the fuel adjustment accurately. If payment for work is submitted via SM in a time period other than when the work was performed, a manual fuel adjustment will be necessary. When this happens, the fuel price adjustment must be calculated for the correct estimate period and a contract adjustment must be made to correct for the difference in the index for the two estimate periods. Calculations should be retained with the contract documentation. A table of fuel factor adjustments (available on MoDOT's V drive, V:\Asphalt\Fuel Factors.xls) is maintained and updated monthly. Asphalt pavement, shoulders, and entrances (full depth and overlays) Yes, all asphalt in Sections 401, 402, 403 and ultrathin bonded asphalt wearing surface. On-Call contracts Yes, but only for the pay items that qualify. Concrete pavement, concrete approach pavement, shoulders, and entrances (full depth and overlays) Yes, including concrete base. For overlays that have separate pay items for placing (SY) and furnishing (CY), only the square yards of placing should receive a fuel adjustment. Full or partial depth pavement repair, asphalt and concrete No, this concrete or asphalt material is for “repair”, not “construction”. Nor would the base rock for pavement repair. Concrete or asphalt bridge deck overlays No, not for most specific deck overlays. If the overlay is a standard asphalt mix used on the roadway, then yes. Type A2 and A3 shoulders Yes, both the surface material and the base rock, but not the portion of base rock identified as incidental. Aggregate surfacing No, aggregate under Section 310 does not qualify. Other base rock such as 12" or 18" Rock Base (Section 303) No. This material is generally set up only when available near the project, therefore it is not adjusted for on-road hauling. Base produced from rock on the project or from an adjacent source No, the material must be hauled to the project. Unique items that don't fit into any category A JSP is usually provided for unique items, and fuel adjustment qualification should be addressed in the JSP before bid (core team discussion item). If that was not done, you will need to negotiate an agreeable solution with the contractor based on the intent of Section 109.14, and issue a change order, if necessary. See EPG 403 Asphaltic Concrete Pavement for guidance on AC price index adjustments. This page was last modified on 1 March 2019, at 13:08.